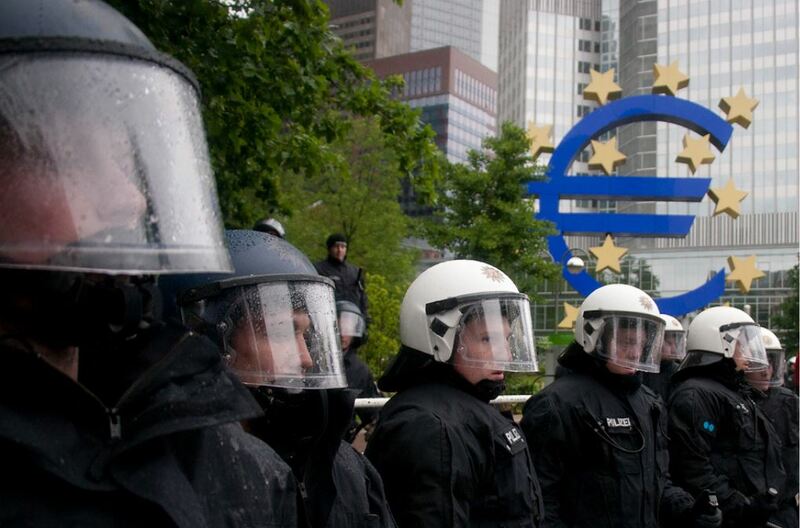 The problem with the European Central Bank is that it has a neo-liberal mandate. It cannot and will not serve the interests of EU citizens because that is not its job. See its role in the Greek crisis. Thus the Euro is doomed, as is the EU itself. Ashoka Mody is Charles and Marie Robinson Visiting Professor in International Economic Policy, Woodrow Wilson School, Princeton University. Previously, he was Deputy Director in the International Monetary Fund’s Research and European Departments. Hélène Rey, a professor at London Business School, argues that the U.S. Federal Reserve determines global monetary policy. The Fed determines the interest rate for the use of the world’s most dominant currency, the U.S. dollar. Fed policy decisions, therefore, trigger the “global financial cycle,” which causes global capital to slosh around the world, placing severe constraints on national monetary policies. Others believe the opposite, tarring all central banks of unwarranted timidity after the onset of the Global Financial Crisis (GFC). Such critics claim that all central banks “failed even to lift inflation to their target” because they did not use their full stimulus capacity. Rey is correct that the Fed is the world’s powerful central bank, but this is so not only for the reason she emphasizes. The Fed is also the world’s most credible central bank, which makes it hugely influential domestically and not just internationally. The Fed did raise the U.S. inflation rate to its 2 percent target. Early and aggressive Fed actions helped propel the U.S. economy to a quicker recovery; that same boldness prevented inflation expectations from falling. In contrast, the Bank of Japan (BOJ) and the European Central Bank (ECB), having allowed inflation rates to fall too low, proved unable to lift them back again. Expressing that perspective, Mohamed El-Erian, chief economic advisor of Allianz, recently described the Fed and the ECB as “the two most systemically important central banks.” But is the clubbing of the Fed and the ECB appropriate? In this essay, I document the costs of ECB timidity, which, I argue, arises from the political limits on its actions and which renders the ECB, by at least one metric, even less effective than the BOJ. The ECB is intensely averse to inflation but is more tolerant of deflationary tendencies. This asymmetric predisposition is not the result of its mandate of achieving price stability. The ECB has chosen to interpret this mandate asymmetrically. It has focused on keeping inflation below 2 percent but has downplayed the goal of maintaining inflation close to 2 percent. In periods of inflationary pressure, ideological commitment to “price stability” causes the ECB to maintain tight monetary policy. The ideology was manifest between 2001 and 2003. Although the pace of economic deceleration and inflation rates were similar on both sides of the Atlantic, the ECB lowered its interest rates only slowly and grudgingly while the Fed drastically cut rates. The ECB paid greater heed to inflation than to the economic slowdown. When national leaders badgered ECB president Wim Duisenberg to ease monetary policy, he famously responded, “I hear but I do not listen.” Similarly, after the start of the GFC, the ECB’s first action was to raise its interest rate in July 2008; more seriously, the ECB raised rates in April and July 2011, setting off financial panic and pushing the eurozone into prolonged recessionary conditions. In each of these cases, the ECB was fighting the threat of a phantom inflation, not recognizing that the ongoing economic slowdown would moderate inflation. 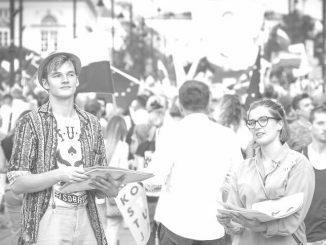 While ideology unified the Governing Council in the fight against inflation, divergence of national interests held it back in countering deflation. The divergent interests became evident towards the end of 2012. In the United States, where the inflation rate was much the same as in the eurozone, the Fed under Chairman Ben Bernanke stepped up bond purchases under its QE programs (Figure 1). Figure 1: The ECB was tardy in fighting deflationary tendencies. (Policy rates, left, percent; central banks’ assets, right, ratio relative to the level of assets in July 2007). 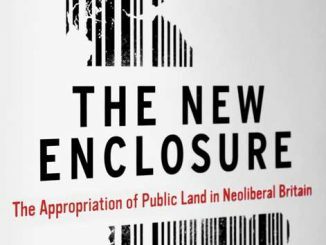 Sources: Left panel – Federal Reserve Bank of New York, “Federal Funds Data Historical Search”; European Central Bank, “Main Refinancing Operations,” fixed-rate tenders; Bank of England, https://www.bankofengland.co.uk/boeapps/database/Bank-Rate.asp; Right panel – Federal Reserve Bank of St. Louis, codes ECBASSETS for the ECB, WALCL for the U.S. Fed. UKASSETS and code RPQB75A of the Bank of England for BoE. By thus helping to bring down long-term interest rates, the Fed sought to induce greater spending and thereby prevent a recession and deflation. In contrast, the ECB stood virtually still. The eurozone’s inflation rate began to fall steadily below the U.S. inflation rate (Figure 2). Figure 2: Euro-area inflation rate began dropping in mid-2013, inflicting the lowflation wound. ECB leadership initially dismissed the decline in the eurozone inflation rate as temporary. In place of a major QE initiative, Draghi offered cheap talk. In November 2013, he said that the ECB had “a whole range of instruments,” which it would deploy “if needed.” In April 2014, he did acknowledge that ECB projections of a rise in inflation had proved incorrect “a few times.” He insisted, however, that the ECB would respond only if inflation remained low for “too prolonged” a period. Such deliberately vague phraseology was an unmistakable—and therefore unsuccessful—attempt to camouflage the tensions within the Governing Council. Northern member states, with Bundesbank president Jens Weidman in the lead, publicly opposed QE. The ECB finally initiated QE in January 2015, but only after lowflation—persistently low inflation rates—had set in. But not only was the eurozone’s average inflation rate stuck at near 1 percent, a troubling divergence in inflation rates was manifest. The inflation rate in Germany was well above 1 percent, while in Italy it was well below 1 percent (Figure 3). This was predictable. Monetary policy was particularly tight for Italy, the weaker economy. 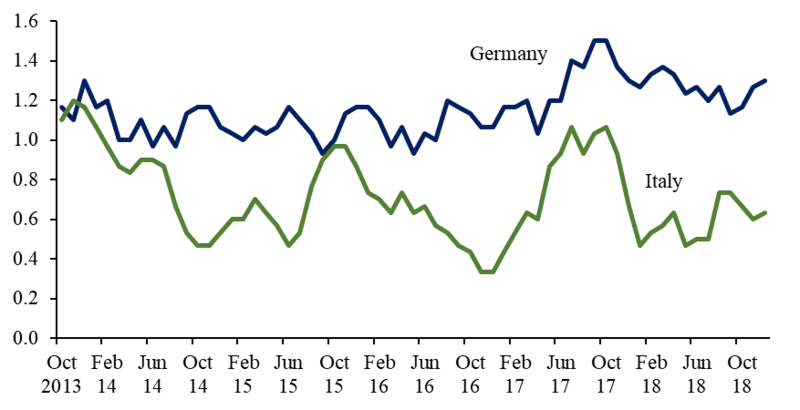 That pushed the Italian inflation rate down, which kept the Italian real interest rate (the interest rate adjusted for inflation) much higher than Germany’s. Thus, tight monetary policy reinforced economic divergence within the eurozone. Figure 3: The eurozone problem: a single monetary policy causes inflation divergence and Italy’s lowflation problem. (Annual core inflation, three-month moving average, percent). Source: Eurostat. Notes: Core inflation is the annual percentage change in the Harmonized Index of Consumer Prices excluding energy, food, alcohol, and tobacco. December 2018 figures are Eurostat estimates. 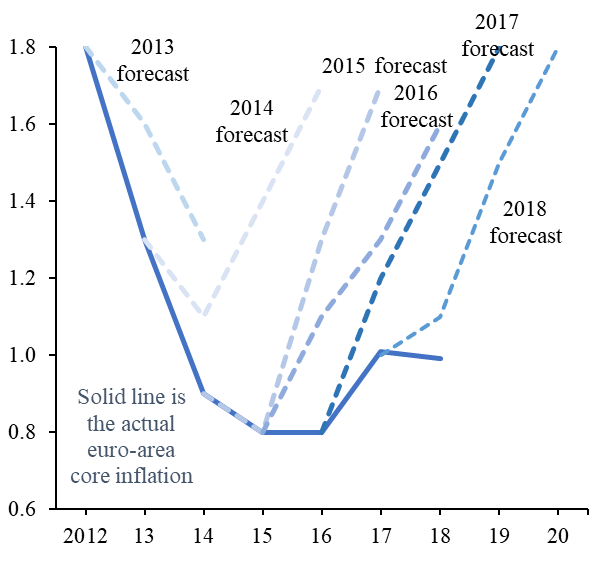 Figure 4: The ECB kept forecasting a rise in eurozone inflation, but inflation remained stubbornly low. Sources: ECB’s Macroeconomic Projections made in March of the year. https://www.ecb.europa.eu/pub/projections/html/index.en.html. Note: 2018 core inflation is the average of months January to December 2018. December 2018 is a Eurostat estimate. 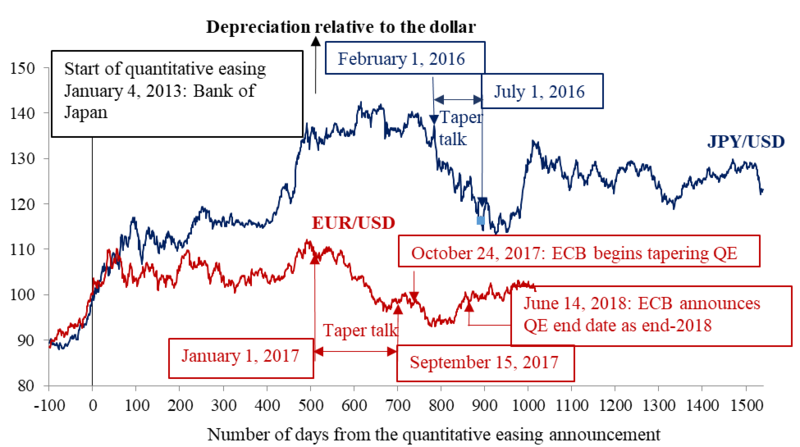 The lack of euro depreciation against the dollar was due to the ECB’s threat as early as January 2017 that it planned to slow down its pace of bond purchases. In October 2017, Draghi delivered partially on that threat. He announced that, starting in January 2018, the ECB would halve its monthly purchases to 30 billion euros. Markets, therefore, had good reason to believe that the ECB would withdraw QE early, which kept the exchange rate buoyed in anticipation of the program’s end. Figure 5: The ECB, even more than the Bank of Japan, lacked commitment to bond purchases. Note: Exchange rate for JPY/USD equals 100 on January 4, 2013 (date of the announcement of QE by the Bank of Japan) and exchange rate for EUR/USD equals 100 on January 22, 2015 (date of the announcement of QE by the ECB). Source: For USD and Japanese yen, https://www.investing.com/currencies; for USD and Euro rates, ECB, https://sdw.ecb.europa.eu/quickview.do?SERIES_KEY=120.EXR.D.USD.EUR.SP00.A&periodSortOrder=ASC. In June 2018, Draghi announced that the ECB was ready to wind QE down. “The Governing Council, he declared, had “concluded that progress towards a sustained adjustment in inflation has been substantial so far.” This was a startling declaration. The core inflation rate was about 1 percent, where it has been for nearly three years. By September, the euro area’s growth slowdown had become manifest, and the ECB revised its growth forecasts down a tick. But Draghi continued to insist that the outlook for growth and inflation remained favorable. At his December press conference, when announcing the end of QE, Draghi presented a bright economic assessment. “The underlying strength of domestic demand,” he said, “continues to underpin the euro area expansion and gradually rising inflation pressures. This supports our confidence that the sustained convergence of inflation to our aim will proceed and will be maintained even after the end of our net asset purchases.” The assessment was disturbingly at odds with the data—with Germany and Italy in near-recessionary condition. Given this pattern of denials, delays, and half measures, it is not surprising that the ECB’s actions failed to move the euro’s exchange rate against the U.S. dollar. In this manner, the eurozone failed to gain the one benefit of QE that both the United States and Japan had received (Figure 6). Indeed, since the dollar appreciated against other currencies starting in early 2015 as the Fed began a gradual withdrawal of its QE bond purchases, the trade-weighted effective euro exchange rate perversely appreciated after the introduction of the ECB’s QE. Little wonder, then, that the ECB’s QE did little for growth. 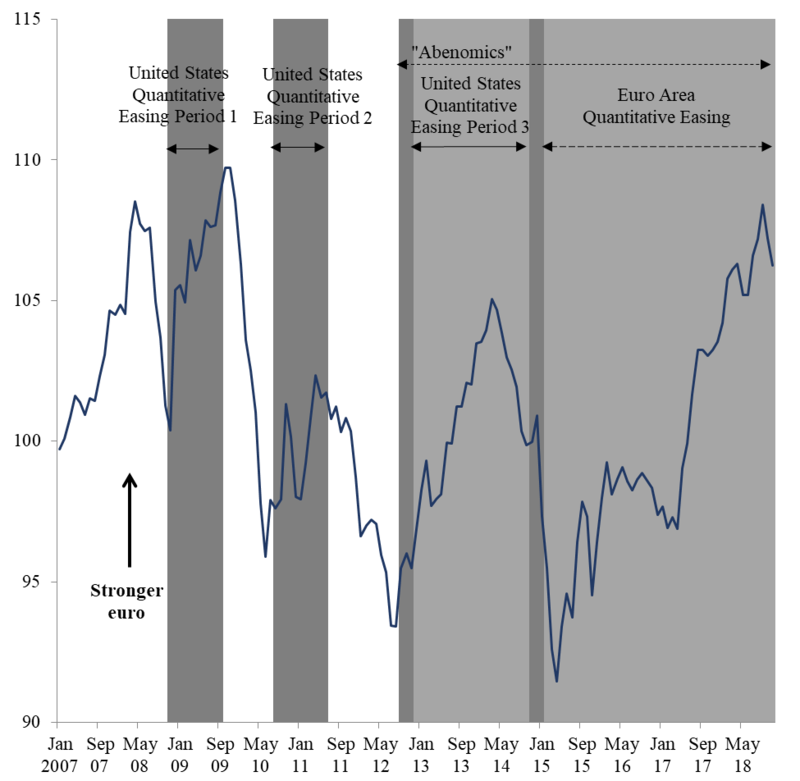 Figure 6: U.S. and Japanese quantitative easing caused the euro to strengthen, as the ECB waited and lost credibility. Sources: Bank for International Settlements, “Effective exchange rate indices, Narrow indices, Nominal”; Board of Governors of the Federal Reserve System press releases November 25, 2008, September 23, 2009, August 10, 2010, June 22, 2011, September 13, 2012, September 17, 2014; Ben Bernanke, 2013, “The Economic Outlook,” testimony before the Joint Economic Committee, US Congress, Washington, D.C., May 22; Shinzo Abe, 2013, “Press Conference by Prime Minister Shinzo Abe,” Prime Minister of Japan and His Cabinet, January 4; ECB press release: January 22, 2015. The eurozone is in a macroeconomic trap. The lack of significant growth momentum during and following the prolonged global financial and eurozone crises caused a compression of imports. The import compression led to a swing from current account deficit to surplus in countries worst hit by the crisis (Figure 7). That surplus propped up the euro’s exchange value, which, in turn, created a further restraint on growth. 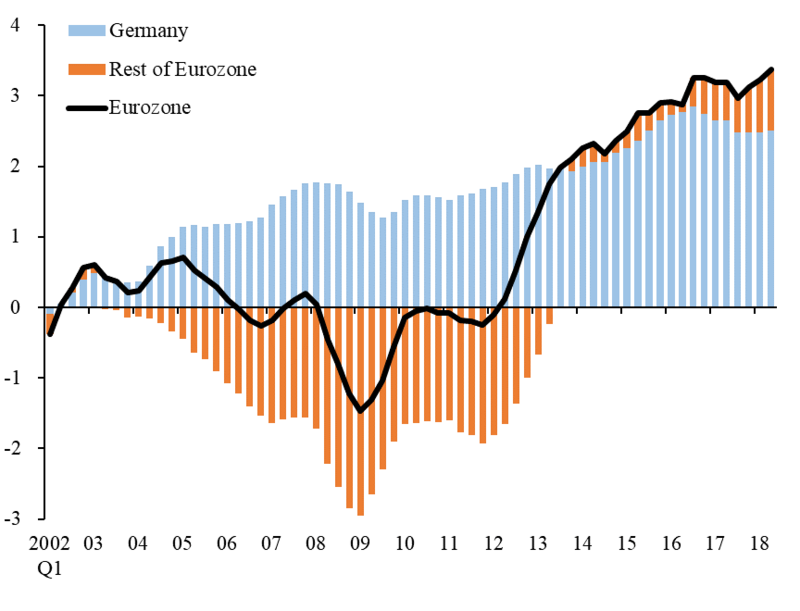 Draghi asserts that the ECB’s “QE has been the only driver of this [euro area] recovery.” To the contrary, the evidence is that QE has made little difference to bolstering euro area growth. Growth in the eurozone remained in the doldrums in the first two years after the ECB initiated QE. In these two years—2015 and 2016—world trade grew at an annual rate of around 3 percent or less. Because European countries are highly dependent on trade, the anemic pace of world trade growth placed a lid on eurozone growth (Figure 8). Figure 8: World trade, rather than ECB’s bond purchases, moves eurozone growth. (Annual growth rates, percent; three-month moving averages) Sources: For world trade growth data, World Trade Monitor, https://www.cpb.nl/en/data; for the industrial production of Germany, Destatis, https://www-genesis.destatis.de/genesis/online/logon?sequenz=tabelleErgebnis&selectionname=42153-0001&sachmerkmal=WERTE9&sachschluessel=X12ARIMAASB&leerzeilen=false&language=en; for France, INSEE, https://www.insee.fr/en/statistiques/3690022#titre-bloc-6; for Italy, Istat, http://dati.istat.it/?lang=en#. Note: Growth rate computed as the latest three-months over the same three months in the previous year. Starting in early 2017, Chinese authorities injected significant stimulus to rev up their economy. As has been true in the past couple of decades, rapid growth in China accelerated the pace of world trade growth through stepped-up Chinese imports and greater activity spurred by Chinese firms in global value-added chains. Higher world trade growth, which reached a peak of over 5 percent in late 2017, predictably spurred eurozone growth. Although it is tempting to attribute the higher eurozone growth to a delayed benefit of QE, in reality world trade was doing all the work. 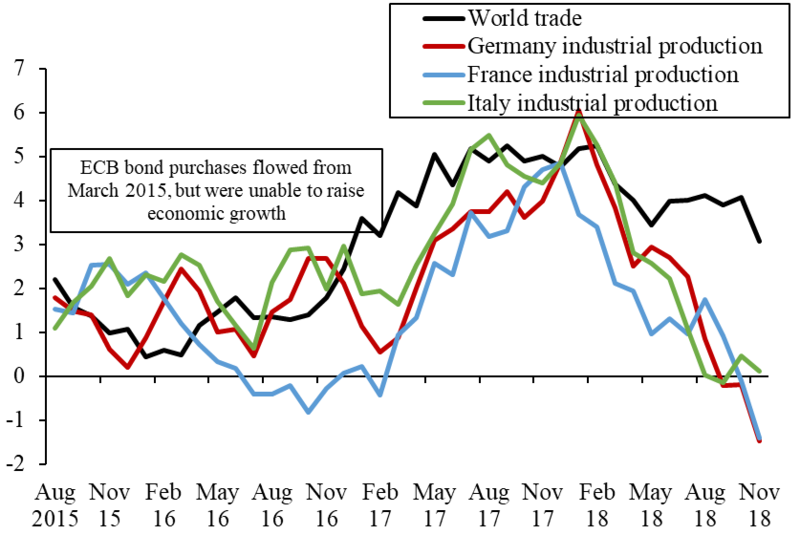 Thus, when the Chinese authorities pulled back on their stimulus for fear of aggravating the already alarming domestic financial vulnerabilities, world trade growth slowed and so did the eurozone. Throughout, QE remained a sideshow. Hélène Rey is right. The Fed, in effect, sets global monetary policy. The BOJ remains unable to move inflation. While the ECB’s defenders often argue that “things might have been worse” absent its QE program, judged by the benchmarks of other central banks and even those set by its own management, the ECB’s QE has no apparent impact on either inflation, the euro exchange rate, or euro area growth. Unlike the Fed, the other central banks have lost the “expectations game.” In June 2018, at Sintra, the Portuguese resort town, Fed chairman Jerome Powell noted, “Today policy makers have a greater appreciation of the role expectations play in inflation dynamics.” BOJ’s Governor Haruhiko Kuroda bemoaned that Japanese consumers have come to expect that prices will remain relatively stable, which has made businesses hesitant to raise their prices. Five years of ambitious QE, he helplessly concluded, have failed to dislodge the “tenacious deflationary mind-set” rooted in the Japanese psyche. The ECB’s political limits to monetary stimulus have prevented it from getting inflation back where it should be. The result: much of the eurozone has fallen into a “lowflation” trap. 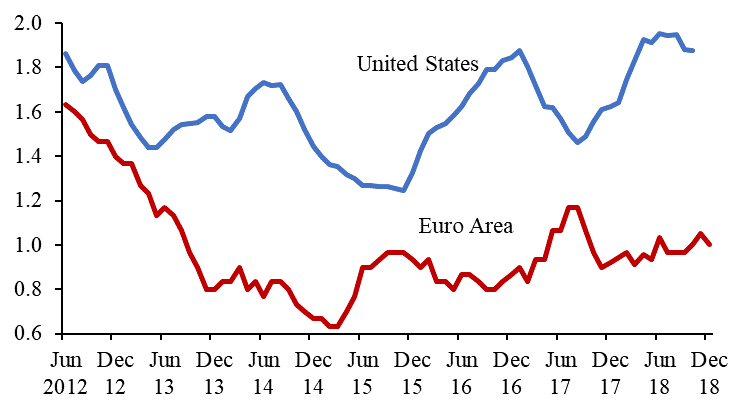 Although no eurozone country is facing outright deflation, lowflation raises the real interest rate, which causes consumers and investors to hold back on purchases, which holds back growth, which validates the expectation that inflation will remain low, which causes consumers to continue holding back on purchases. Among central banks, the Fed stands out because its commitments are the most credible, allowing it to influence expectations most effectively. 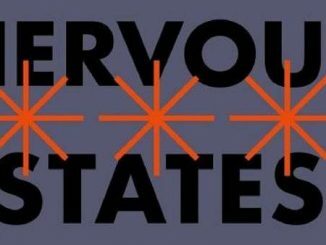 In the latest crisis, the Fed began early and did not equivocate until 2013. Thus, the Fed engineered large depreciation of the dollar through QE and slowly but surely brought inflation back to 2 percent. The BOJ undermined its own credibility in the 1990s, when it hesitated in fighting the deflation threat. That loss of credibility has continued to haunt Japan. Even in the latest QE round, despite its ambition, episodic hints of tapering have undermined the BOJ’s efforts. The BOJ, therefore, has been only partially successful: some yen depreciation but little traction on prices. That expectation of a rise in euro area interest rates keeps the euro-dollar exchange rate bound in a narrow range even though the Fed has already raised its policy rate from a target range of 0 to 0.25 in December 2016 to a range of 2.25 to 2.5 percent as of December 2018. A rise in euro area interest rates could prove unbearable in many eurozone countries. 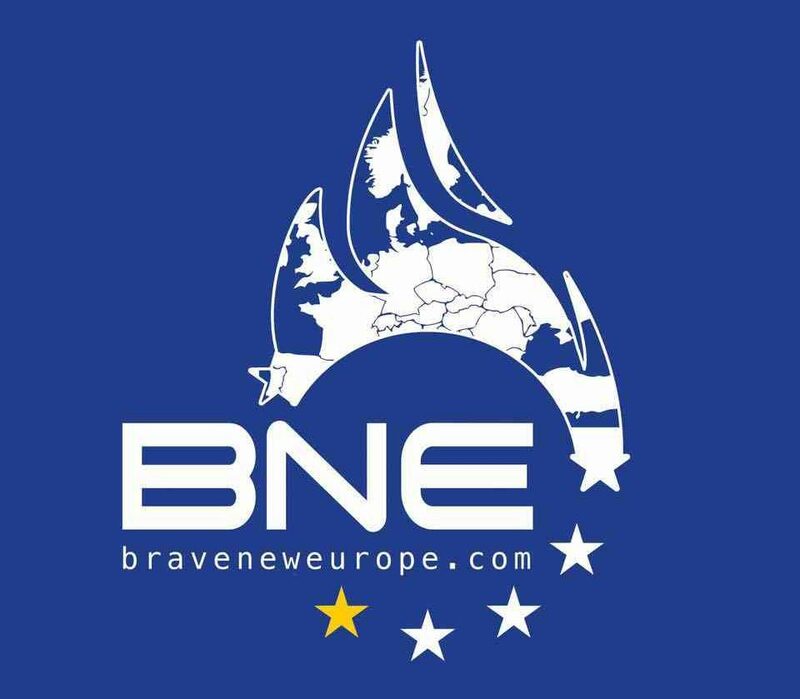 Their real interest rates are already rather high, productivity growth rates are very low, and the effective euro exchange rate, stronger than at the start of QE, could become even stronger. The ECB has reiterated that it could resume QE. At his December 2018 press conference, in response to a question on whether the ECB could “deal with the next economic slowdown,” Draghi responded, “we have instruments.” These are the same words he used when the ECB postponed QE in the crucial 2013-2014 period, allowing lowflation to set in. If eurozone growth remains weak, a hesitant effort to renew QE—amid discordant voices from the Governing Council—will be met with deserved skepticism. It could all be rather unpleasant.